Real Madrid looked to take advantage of Barcelona’s loss earlier in the day against Levante to go top of La Liga, while Sevilla are trying to build on a solid albeit mixed start under new coach Pablo Machin. 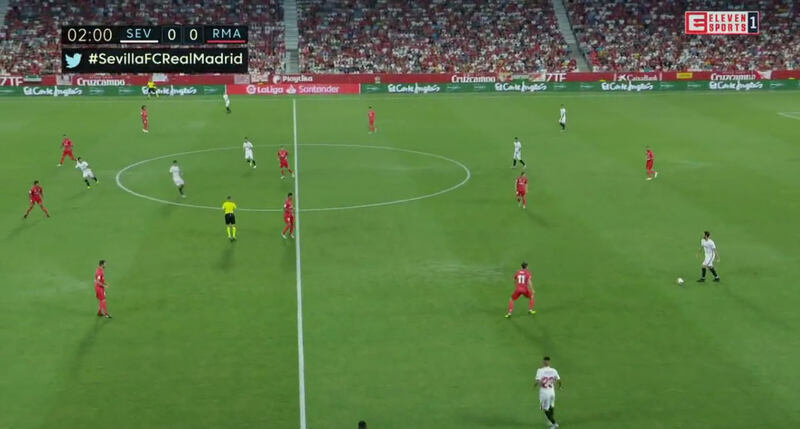 Machin set up his team in a 3-5-2 formation, whereas Julen Lopetegui opted for a 4-2-3-1, with Luka Modric playing off of Karim Benzema in attack. The initial set-up didn’t work for Madrid, causing them to circulate the ball in a U-shape. Sevilla dropped off into a 5-3-2 when defending, with Andre Silva and Wissam Ben Yedder blocking the passes into midfield and forcing Madrid wide. From there either the outside midfielders in Sevilla’s trio or the wing-backs would push up and close down the man on the ball depending on where he was – if it was closer to the half-way line, it was the job of the outside midfielder to save the wing-back having to sprint 40 metres out from the back line, but if it was in the final third, the wing-back would step out. The back five meant that the defence was always well-protected but it did also create a shortfall in midfield, so if Pablo Sarabia moved out towards Marcelo for example, just Ever Banega and Franco Vazquez would be left to cover the midfield. Ben Yedder would drop off a little to help out, but he wouldn’t drop into the midfield line alongside the others, meaning there were gaps to exploit. Madrid never did though. Modric, fresh from being named the world’s best male player by Fifa, may have started his career as a number ten, but it’s been a while since he played that role and he looked uncomfortable here. 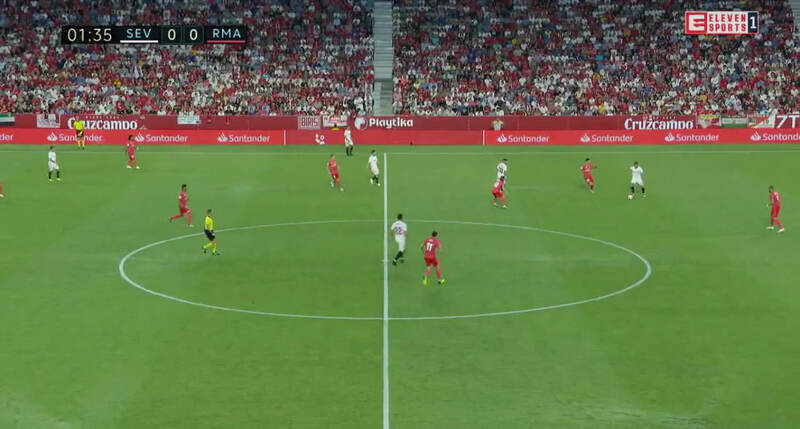 Rather than positioning himself between the lines, he was often up alongside Benzema – this meant he was too far forward to really act as a link between the defence and attack, while also not posing any headache for Sevilla’s defenders. If he had played between the lines, the midfielders either would have had to keep an eye on him, when they already had a lot of space to cover, or one of the defenders would have had to step out, creating some space in the backline for an attacker to use, but as he just stayed so high Sergi Gomez could mark him without really having to adjust his position. When the ball was played down the left, Modric would drop deep to the right of Casemiro, which allowed for a switch of play to that side, but then the problem remained when it got there: there was no one between the lines to receive the ball as Modric, the player nominally playing that role, had dropped so deep to enable the switch of play. As a result the ball would either go along the line to the wingers Gareth Bale and Marco Asensio, who were easily smothered by the wing-backs sticking close to them, safe in the knowledge that they had cover from the centre-backs next to them as there was only Benzema for the three of them to track, or it go back again to the opposite flank, where the same problem remained as there was no one through the middle to pass to. With Modric not moving between the lines, Toni Kroos dropping into a deep left-sided position and Casemiro offering little creatively, Madrid badly missed Isco, who is out having had surgery for appendicitis. While Madrid struggled to break down Sevilla, the home side started strongly, which was aided by Madrid’s attempts to press them. Initially they would allow Sevilla to pass out to Simon Kjaer, with the wingers tucked into midfield and Benzema blocking the pass into Banega, but once the ball was played out to one of the outside centre-backs, the winger would look to press him while blocking the pass out to the wing-back, Benzema would move up to cut off the return ball to Kjaer and Modric would move up to mark Banega. 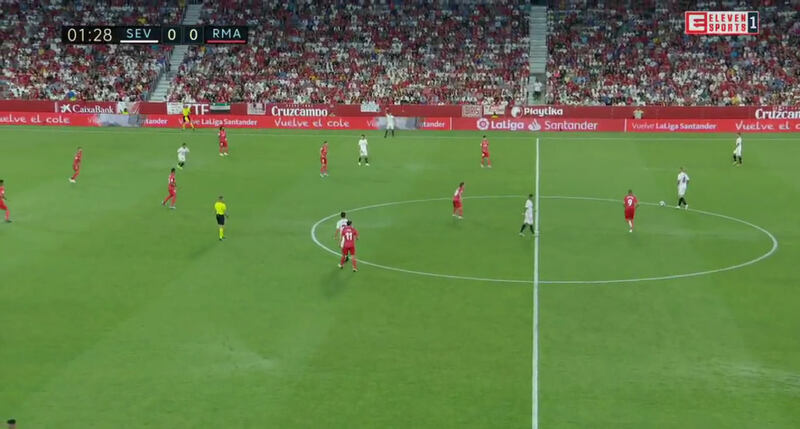 Sevilla found it easy to play around this pressing however for two reasons: firstly, Banega is really good on the ball and found it easy to shrug off Madrid’s challenges, and secondly Vazquez would drop back alongside him, enabling Sevilla to outnumber Real in this area. Madrid attempted numerous different ways to get around this man disadvantage, but all of them caused a shortfall somewhere else on the ptich. Gomez can easily pass out to Arana, who can now easily pass to Vazquez. Nacho is forced out of the backline to close down Arana, leaving space behind him. 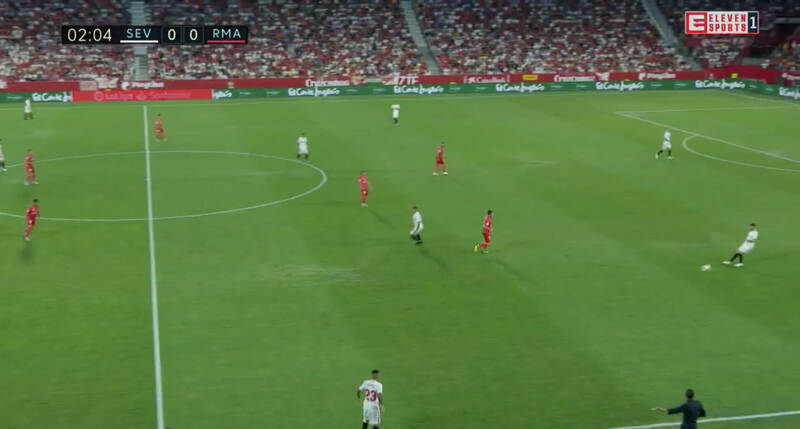 Casemiro steps up to mark Vazquez so Sevilla prompt the press again, having forced Nacho and Casemiro up-field, leaving them space on the flank and in front of the Real defence for Ben Yedder to drop into. This move finally ended when the goalkeeper attempted to hit the ball long out to the flank, only for it to be driven out of play, however it highlighted the ineffectiveness of Madrid’s pressing – Madrid either left a free man in the build-up, making it easy for Sevilla to play around them, or they pushed too many men forward, leaving their defence unprotected. This was a constant problem for Madrid in the first half, with Marcelo in particular getting dragged too high up the pitch and Sarabia making runs behind him. 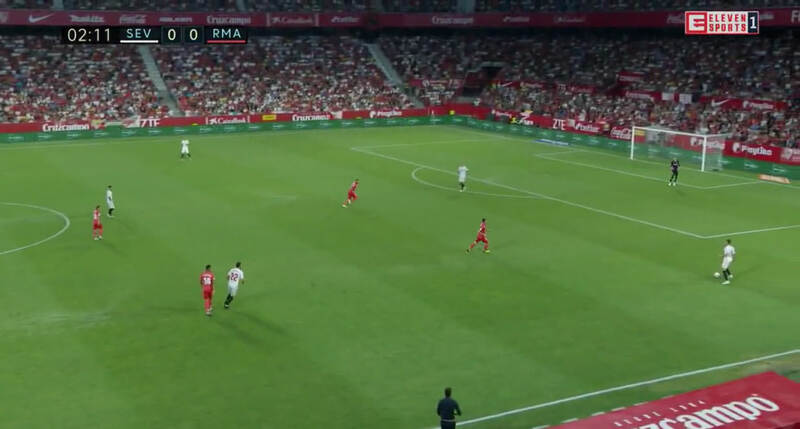 Sevilla nearly scored straight from kick-off due to this: Asensio’s pressing ineffective, Marcelo dragged high to cover and Sarabia running into the space he leaves behind him. Sevilla’s goals didn’t reflect this build-up however. The first was probably the closest to reflecting the general pattern of play, with Casemiro and Marcelo caught out, but truthfully it was just poor play by the pair unrelated to strategy. Casemiro failed to track back and Marcelo’s pass fell straight to Sarabia. Ben Yedder, Silva and Jesus Navas then sprang forward, with Raphael Varane and Nacho left three against two with Marcelo unable to recover – Sarabia played it for Navas to run onto and Navas squared for Silva to finish when Varane finally moved across to close him down. Casemiro and Marcelo may have been caught high, but Sevilla hadn’t forced them forward with their build-up, they just hadn’t moved back. The second was even simpler: Real Madrid commited a lot of players forward for a corner, but didn’t win the header or the second ball on the edge of the area. Sevilla sprung forward quickly again, catching out Madrid when they left just Nacho and Modric back. The third was simpler still: Madrid cleared a cross from a corner but lost the second ball. 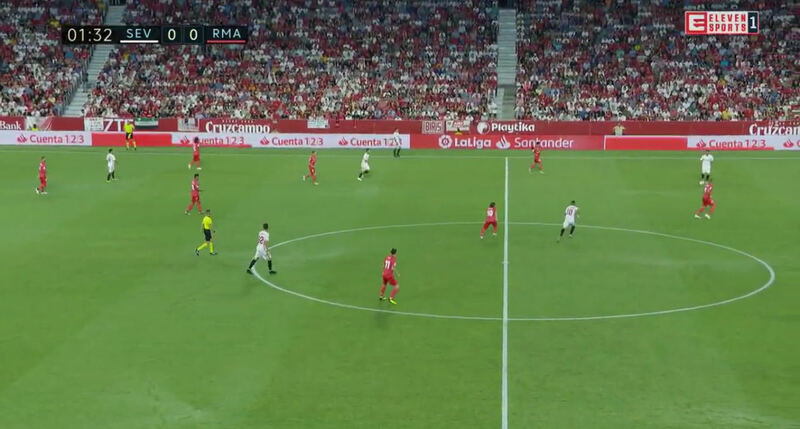 The backline didn’t get out fast enough to play Ben Yedder offside but also didn’t position their bodies to be able to turn quick enough to respond to losing the second ball, meaning they couldn’t get close to Ben Yedder before he finished. Lopetegui rearranged for the second half, switching to a 3-4-3 as Casemiro moved back into the defence and Modric dropped in next to Kroos. The change made it easier for Marcelo and Nacho to get forward as the defence would be less stretched behind them with an extra man. 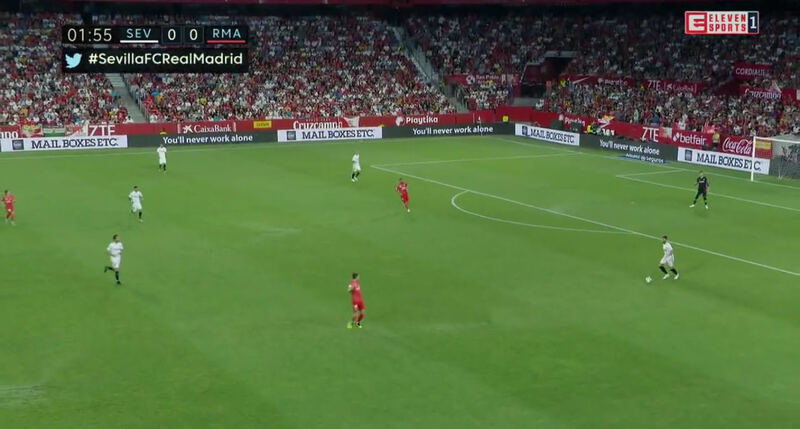 Marcelo and Nacho getting forward in turn made it easier for Asensio and Bale to get free, as while in the first half Sevilla’s back five had to defend against just three men most of the time, now they were having to keep track of five. The back three could stay back and defend and Kroos and Modric could sit in front of them, quickly releasing the frontmen with pinpoint passes, while Bale and Asensio would tuck inside ahead of them to provide that central attacking presence they missed in the first half. The change also helped in defence, as Marcelo and Nacho could stay closer to Navas and Arana, without leaving Varane and Sergio Ramos alone against Ben Yedder and Silva. In the 59th minute, Lopetegui made a double change, substituting Nacho and Benzema for Lucas Vazquez and Mariano Diaz. The system was kept the change but the personnel suited the task better: Vazquez better going forward and Mariano more of a poacher. Machin responded to Madrid’s changes ten minutes later, switching to a 3-4-3 himself as Quincy Promes came on for Ben Yedder. It was a defensive change, sacrificing some attacking presence to stop the midfield getting stretched across the pitch, but Sevilla held Madrid at bay. The European champions were far more dangerous in the second half but Sevilla defended well and any hopes of a comeback died when Marcelo came off injured, as Lopetegui had already used his last substitute to replace Modric with Dani Ceballos. 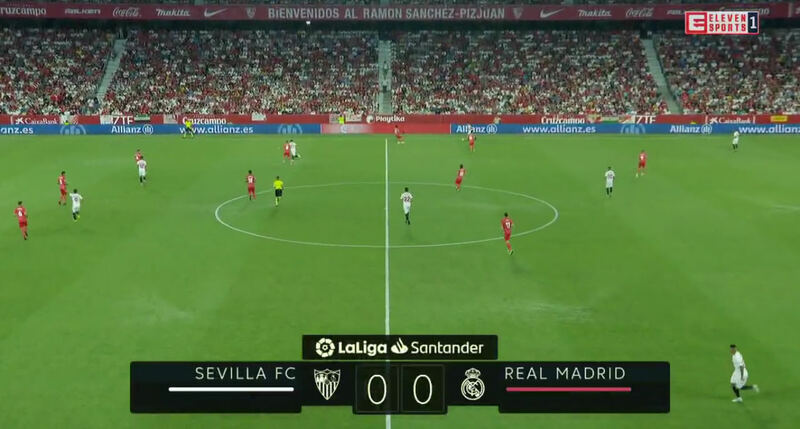 Sevilla had just about held off Madrid’s five man attack, but Madrid going down to ten forced Asensio back into a wing-back role, meaning Madrid’s attack were now outnumbered, allowing Sevilla to comfortably see the game out.